Chances are you have at least eaten Basque-influenced food, even if you didn’t know it. Being vegan in the Basque Country isn’t hard as one might think – if you know where to look for vegan Bilbao hot spots, like an all vegan pintxos bar, and vegan San Sebastian goodies like where to get a vegan Spanish tortilla de patata (more on both below). The Basque country is considered one of the top food scenes in the world. Basque restaurants frequently pepper the top 50 and 100 lists in many publications. The Basque have a varied and nuanced history and have played a much bigger role than is commonly known in many Western worlds developments. The Basques proliferated salted cod, which allowed a huge expansion of nautical exploration (see the Basque History of the World in our top 25 books for Spain for more). Even one of our favorite restaurants in Madrid, Landareak, is named after the Basque word for vegetable because it conjures up the Basque reputation for excellent food. Both Sam and I have some Basque in us, something we discovered right on our very first date. Sam’s grandmother’s last name is Irizarry, a very typical Basque last name (her father was Basque). My great aunt is alive and well at 105, living in the small city of Biarritz in the French Basque Country (whom we visited on this trip). Anytime you see those Z’s, R’s, X’s, and T’s together, there’s a good chance it’s anglicized Basque. Like “Jatetxea” on this storefront. The Spanish Basque country is very different than the rest of Spain, and you’ll see it in your immediate surroundings. Over the Montes Vasco in the north, the countryside becomes a much wetter, cloudier climate. Consequently, the country is very green, and many of their cities lie on the coast or near it, connected via rivers and the excellent Euskotren, the Basque train system connecting all the major cities along and near the coast. Overcast and green? You’re in the north of Spain. Chances are that if you’re visiting San Sebastian aka Donostia, the most touristy Basque city, you will have likely considered a trip to Bilbao, a city twice the size and an hour bus or car ride away. We’d strongly recommend checking out both cities during your trip as they’re so close to each other yet have very different things to offer. Here in this guide to vegan Basque Country, we will include both cities, as San Sebastian had very little to offer in restaurants with vegan food, while Bilbao was impressively nascent in its vegan rise. It seems that veganism goes hand in hand with the rebellious nature of the Basque people. There is an impressive amount of resources online that compile lists of every vegan food available, regardless of quality. Here we’ll try to pare down the selection and offer some guidance – what’s a must try, what’s a must miss, and how to optimize your visit. Since the Spanish Basque Country lies all along the northern coast, its no surprise that seafood features heavily in Basque cuisine. Never fear! We’re here to help you find the best vegan food in Basque Country without a drop of fishiness. For completeness sake, we will mention places we didn’t get a chance to try, although we’d be surprised anyone is spending as long as we did in Basque Country, as most people are bent on flying through cities every couple days and that’s just not how we travel. We were lucky enough to be guided (and stay with!) our friend Patricia, who we met through none other than Instagram. She hosted a 20 person vegan Instagrammers meetup in one of our favorite vegan restaurants in Madrid, and invited us to come stay with her, her boyfriend, and their two puppies in Bilbao whenever we pleased. We would not have had the same experience had we just dropped into Bilbao without knowing someone. And let us highlight – we met Patricia online. Anyone with an internet connection can meet future friends online, whether it’s through Instagram, Facebook, Snapchat, Twitter, or others. We’ve met friends through all of these mediums! Ok, back to vegan Bilbao. One of the first places we stumbled upon was completely by accident, showing that the vegan scene is growing rapidly in Bilbao – it wasn’t even on the map yet! Eating pintxos (pronounced “peench-o”) is one of the quintessential experiences to have in the Basque Country. Pintxos are often called the northern Spain version of tapas, and while it’s true that pintxos are small plates eaten at bars, there are some several key differences between pintxos and tapas. Pintxos are often elaborate and served on top of bread. You always pay for pintxos. On the other hand, tapas can be small plates that are free with your drink, or larger raciones (rations) that you order and pay for. 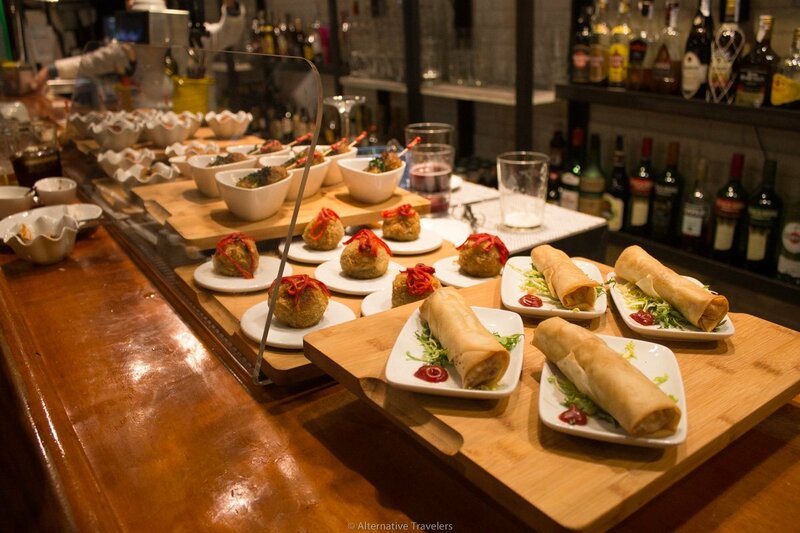 For more on vegan tapas guides, check out our Granada Vegan Tapas Guide and our Madrid Vegan Tapas Guide. We also have a section on vegan tapas in our vegan guide to Valencia. For more on the difference between pintxos and tapas, this excellent article goes into more detail. Considering your options, there are many places with random hours, including a vegetarian restaurant in Bilbao that’s not open on weekends! We’ve narrowed it down to the ones worth your attention and likely to come across. If there’s one experience you can’t miss when it comes to vegan pintxos in Bilbao, it’s this one. At the bar, you’ll see the typical display of dozens of choices lined along the counter, just as you’ll see in virtually all pintxo spots. Expect so many choices that you can’t hope to try them all, including four kinds of vegan tortilla de patata. Keep in mind that the same choices aren’t there every day, just like everywhere else. With a really divey decor and gregarious tattooed bartenders to match, this place really is an experience unto itself. Come for: authentic pintxos made all vegan in the festive atmosphere of the Basque country. Shout out to this recently opened all vegan bar with very variable hours. Double check before your visit. Expect typical Basque food and pinxtos. We didn’t get a chance to try this as it had not opened yet, but can’t wait to try it. Report back in the comments if you’ve had a chance to check it out! This very Basque bar is named after the beloved and popular Uruguayan ex-President who is a former guerrilla, donated 90% of his salary while in office, and has Basque ancestry. For a very local experience, look no further. While it has a plethora of non-vegan pintxos, it also features a few well-intentioned vegan options. These are basic run-of-the-mill vegan pintxos, meaning stuff assembled from premade vegan products. It’d be amazing if every place had at least these. Hopefully, this spot is part of a new vegan trend. However, there are better vegan pintxos out there. We’d suggest going for the sandwiches with moist veggies, as the Spanish do not typically dress their sandwiches with mayo or any sauce, and your parched, salted mouth will miss it. Come for: vegan pintxos if you can’t be bothered to visit Tirauki for some strange reason. We recommend: stopping in a for a drink but saving the rest of your time and hunger for Tirauki. This little eco tienda serves mostly vegan pintxos and a ton of premade, ready to eat locally made vegan dishes. While they serve fish here, there’s an overwhelming amount of vegan options. We spent a while just staring at the case of products that are locally made in Bilbao. They even have a menú del día (lunch special) for 7 euros! We had some pintxos and coffee: beet burger, seitan sandwich, and the tortilla with spinach. They also serve coffee with a big selection of plant based milks. Come for: a great selection of vegan options to go or to stay. We recommend: always sitting down as they do in Spain. Order up anything on offer, as it’s all solid. The tortilla española was a bit dry, but otherwise, all the pintxos were tasty. Note: tiny, just a couple of tables. A very green decorated spacious place with an extensive menu, and several choices for the menú del día (lunch special), curiously separated into a raw section, a “healthy” section, and others. They’re not messing around. The level of vegan-friendliness is impressive as everything on the menu is labeled and they even denote raw items. One of the best Spanish meals we’ve ever had, with nuanced flavors and textures – this is pro chef level stuff. We had a rice bowl with perfectly cooked veggies and a mushroom paté with a raspberry reduction (a flavor pairing that worked surprisingly well), and breaded and stuffed zucchini rolls (pictured below). This we finished off with dessert. A super moist papaya cake with passion fruit sorbet, and a molten lava pile of chocolate brownie that melted in your mouth. While the menú featured some typical offerings, what stood out was the delicacy in flavoring and cooking. Despite all this, their pinxtos were surprisingly mediocre. Bland, uninspired and just missing the pop of flavor and texture in their prepared-to-order food. Come for: a variety of vegan options that are well-intentioned and some of the best Spanish food we’ve had. We recommend: the menú del día for the best experience. Pintxos were surprisingly underwhelming, while the menú del día was one of the best we’ve had in Spain. There are two premiere vegan bakeries and both are worth your attention. It’s not a coincidence that we visited the best vegan restaurants in Bilbao twice each – why go elsewhere when our first visit showed that a return visit was necessary? Bohemian Lane is a cozy cafe ironically located on Calle Carniceria (Butcher’s Street). They offer a plethora of vegan sweets but also delicious savory options as well. Our first time we devoured the tortilla and croissant sandwich, which was deliciously excellent. Everything was moist and tasted fresh. Their tortilla is one of the best and we’d know – we’ve written guides all about vegan tortilla. The second time we had a palmera (flaky Spanish sweet pastry) topped with a dark chocolate plate of armor. Palmeras are very Spanish and very rarely vegan, so we were extremely excited to try this one. The food here is super homemade and exceedingly excellent. They could totally use another location as they’re always busy. They offer tons of tea options, cakes, muffins, and a few savory things that may run out if you come later in the day. We recommend: the super moist tortilla, croissants, cakes, muffins, tiramisu – hard to go wrong here. Note: tiny, just a few tables and cushioned bohemian style floor seating. This vegan Bilbao bakery is run by Polish owners, where they weigh the cake and pie slices to price. We had the signature apple cake, which was quite perfect – crumbly bottom with thick sweet soft slices of apple. Patricia, our lovely host, loves the cappuccino cake and we made sure to grab it for her. Everything we tried here was incredibly top notch, so come here if you’re feeling up to splurging a bit, or “splashing out” as the Brits say. While many places are listed as having vegan options on Happy Cow – take it with a big grain of salt. Many places we walked into didn’t have any of the vegan options listed online – most often the bars. Since the pintxos offering changes daily, it’s possible that some places sometimes have vegan pintxos, and sometimes not. Also, once they sell out of something, they don’t make more that night. Below are the vegan-friendly places in Bilbao where we successfully found vegan food. Note: there are also two vegetarian restaurants in Bilbao: Twiggy and Garibolo. We didn’t make it to either after hearing reports that most of the food is vegetarian, with most dishes containing eggs and dairy. We stumbled in here on our last morning, when most other places were closed. At first, the server wasn’t sure if there were vegan pintxos, but upon further investigation, she was able to find three for us, all of which were quite good. We tried bread topped with mushrooms and caramelized onions, a veggie burger, and a tomato tartar. They offer soy milk for coffee. The interior leaves much to be desired and doesn’t quite feel like a hangout spot nor our vibe. We recommend: all the aforementioned pintxos were solid, though, for a nighttime hangout, Tirauki (or even Bar Jose Pepe Mujica) is a much-welcomed improvement. Hot Dog House sports a two-part process for picking your hot dog or burger, choosing your protein, and then some toppings. Go for the hot dog with some pickles. Expect some difficulty eating, as someone had the questionable idea of slicing the bun completely through the middle. Still, it was a tasty and satisfying dog in every other category. Come for: hot dogs and hamburgers made vegan for cheap! We recommend: the hot dog, but the burger is solid as well. Anytime we find a place that offers vegan options that aren’t just subtractions, we’re ecstatic. But when we find a pizzeria with its own separate vegan menu AND some homemade vegan ingredients, we need a word for beyond ecstatic. All of the vegan pizza combinations at Trozo (which means “piece” in Spanish) have tomato sauce and vegan cheese – which they clearly know how to use. Just slightly melted vegan cheese can be too gooey and “sickly” (to quote a British friend), and overcooked will be too dry and chewy. These people at Trozo get it just right. The romesco sauce, green asparagus, caramelized onion, tomato, and mushroom pie. What’s above and beyond here is the many toppings. I’m sure you could order just a plain pie, but you’d be missing out on half the fun. Left half is fatafel, green pepper, curry sauce, black olive and the right is handmade seitan, caramelized onion and mustard. To top it off (pun intended), there is plenty of outdoor seating to view the beautiful Plaza de Gas. Come for: excellent crispy pizza pies cooked to perfection with quality vegan toppings. We recommend: any of the above-captioned pies, sometime towards the evening so you can see the beautiful series of street lamps light up the plaza. Note: Open every day from 20:00 until 00:00 (8pm to midnight). Plenty of interior seating, but the outdoor space is where it’s at. This is the more touristed city of the two. Called Donostia in Basque, this city is half the size of Bilbao, but right by the coast with epic views of two crescented beaches joined with a mini mountain with the Sacred Heart statue of Jesus Christ on top. There are technically two vegan restaurants in San Sebastian, but only one is a sit-down table service restaurant. This is the premiere vegan restaurant in San Sebastian. They serve a rotating daily menú del día (fixed price three course meal) They get rave reviews wherever one can review it online. Going here was on the top of our list. That being said, if you don’t make going here a priority, don’t expect to stroll in on a whim. They only serve during the typical Spanish lunchtime, meaning 13:00- 15:30 from Tuesday to Saturday. If eating out is more a matter of convenience for you, keep in mind the rest of the places we will mention below. Come for: the sole entirely vegan menu experience in San Sebastian. Though Km.0 (see below) offers vegan menús as well. We recommend: make a reservation as soon as possible. Don’t travel to San Sebastian on Sunday, Monday, nor a holiday as we found out they were closed for the entire duration of our trip (we were traveling on a Spanish holiday). This is a “vegan butcher” counter with mostly vegan products and some take away food. Their hours vary a bit day to day, and aren’t always open for the usual meal times. Again, if you want to go here – make it a priority. We found that more likely than not, these will be the places that will be open and more convenient for visitors, as their hours and locations are just that much more accessible. If you’re looking for a truly local spot – look no further. Km.0 has been around since 2014 and most of the menu is vegan. This place is the real deal, with proud Basque owners and a waiter who first spoke to us in Basque (guess we looked the part). There are two seating sections and plenty of tables – one section is for pintxo people while the other section is for lunch leaners. Their menú del día is the best deal you’ll get here. You’ll have 4 choices for the primero and segundo, and at least two for dessert. They also have vegan pintxos, and we recommend the deliciously veggie vegan tortilla. Vegetables are quite literally the stars of the show here. They are very low on the imitation animal products and high on the expertly executed vegetable goodies. If you’re not a fan of veggies (you’d be surprised how many vegans aren’t) you may not like the food. A couple next to us had the biggest stank faces on, looking at every plate in disdain as if the menu promised a rare steak and instead gave them overcooked green beans. Veggie lovers – rejoice! The dishes get creative. We had stuffed red peppers, a caviar style black lentil salad, and coca verdura: a flat bread-ish thing topped with roasted eggplant, tomato, zucchini, all rendered down to tender savory juiciness. This was easily our favorite vegan San Sebastian spot. Even the desserts were impressive. A slice of creamy and rich tiramisu and caramel sauced covered apple pie. They tasted as good as they looked. Come for: an indulgent lunch that’s heavy on the veggies. They also serve a lot of pintxos if you’re looking for a bite or two less. We recommend: the excellently portioned and priced lunch. Also try their vegan tortilla, which was also chock full of veggies. This beachfront spot offers buddha bowl type fare along with some typical Basque food and pintxos. The menu is small, especially compared to Km.0, but if a view of the beach is your number one goal, you’ll be glad to have some food to enjoy too. This spot has some unorthodox service where you help yourself to everything but the food you order. For those wanting to check out something a bit different. While Happy Cow will churn out almost half a dozen spots, upon closer inspection, many of them don’t offer well intentioned vegan options, mostly made vegan via subtraction of non-vegan items. Below were our picks for the most worthwhile ones, with one being a big mistake we want to warn others of. Lots of veggie options in both their sit down and take out location. It’s a solid spot – their burger and sandwich offerings were definitely above average in the satisfaction department. Technically this was a vegan madeleine, according to the proprietors. They even had some vegan cakes and muffins! Come for: solid vegan fare via a couple of options. We recommend: the sole vegan main plates of the burger and the sandwich. We’re including this place in the list because we suspect a many hungry traveler stumble upon this spot due to its convenient location. Let’s be frank: this place goes in the category of “worst vegan food ever”. Heed the mostly bad reviews online – it catches people because it’s open when everyone else is closed and has, at first glance, a lot of vegan options. We ducked in while it was raining and we were starving, as they had an extensive menu with clearly marked vegan options. However, all of them they were overpriced and terrible. The “pizza” was actually a wheat tortilla topped with almost no sauce, piled high with vegan cheese and mock chicken yet impressively lacking in flavor. The other dish of albóndigas (meatballs) were a rip off – 13 euros gets you four smaller-than-golf-balls-sized meatballs, with the tiniest side of bland hummus and three slivers of bell pepper. How they honestly charge more than five to six euros for this paltry plate is beyond me. You could barely call this “main plate” an appetizer. To top it all off, one of the most easily made vegan dishes, tortilla española, was horrendous. Generally, we always finish our food on principle, even if we didn’t love it, as we can’t bear to waste food. Yet this vegan tortilla was so bad that we abandoned it after one bite each. Imagine if someone forced a spoonful of undercooked mushy flour with boiled potato down your throat and you’ll get an inkling of just how bad it was. Somehow we spent 30 euros at a place that would have given us gold at the top vegan spots in Madrid. We left feeling rightly swindled. Yet the place is packed, and everyone seems to be having a good time – smells of a tourist trap that got us good. Come for: if you’re on the verge of starvation and this is the only solution. Personally, I’d rather go hungry than eat this garbage again. We recommend: not coming here for any other reason. There’s a vegan hotdog on the menu! Basically a build a hotdog spot, where you can choose up to 10 toppings on your dog. Here we recommend going with your preference, as different preset combos will produce a very different tasting dog. As you can tell Sam and I prefer very different toppings. Whichever one you think looks better – I chose. Make sure to double check which toppings are vegan – one of the mustards isn’t. The staff is knowledgeable about veganism. We recommend: the sole vegan dog, with whatever you want on top. All in all, we thoroughly enjoyed our Basque country trip. Getting around via the Euskotren was a lot of a fun and super convenient. Just how well the Basque country is connected is really impressive. If you’re looking for some alternative travel, both cities can be enjoyed at a slow pace on a budget. If your priority is laidback city hanging with the best vegan eats, Bilbao wins in a knockout. If you’re looking for the more usual touristy fare of epic views and beautiful scenery to take selfies in, with food being demoted to the rank of convenience, then San Sebastian will please you. As for us… we’re all about the roads less touristed, lined with vegan pintxos. Tirauki, we will be back. This huge database is compiled by user submissions. If you’re into doing intricate vegan for your trip – search away! Keep in mind that listings themselves are in no way an endorsement or verification of the quality of vegan food available – it’s an index – not a guide with opinions like you just read by us. Indefinite Adventure’s Vegan Guide to San Sebastian. For a closer look at the finer dining of vegan San Sebastian, check out our friends’ guide, as we focused on the budget spots.